CommView Remote Agent for WiFi should be installed on a computer that has a compatible wireless adapter (to be used for monitoring) and Ethernet adapter (to be used for the connection between Remote Agent and CommView for WiFi). You must have administrative privileges to install the program, although such privileges are no longer required after the initial installation and configuration. You must NOT install both CommView for WiFi and CommView Remote Agent for WiFi on the same computer. To install the program, run SETUP.EXE and follow the instructions on the screen. 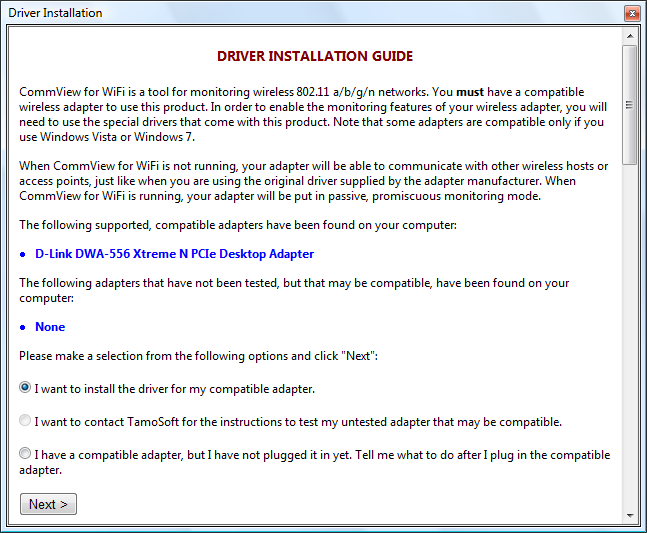 The first step is installing the special driver for your compatible wireless adapter. The Driver Installation Guide will guide you through the installation process; you will need to scroll down to the bottom of the page shown below and click Next to initiate the driver installation process. 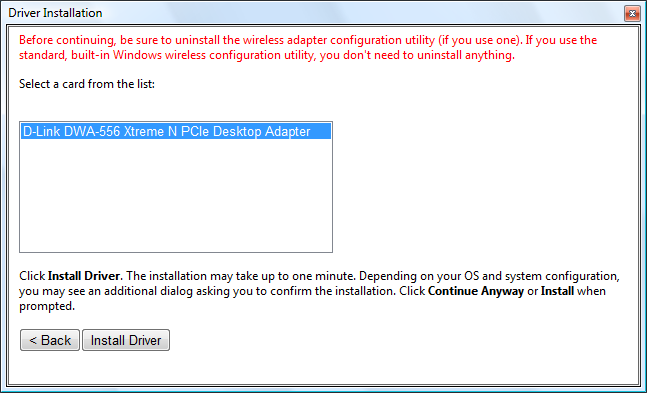 The driver can be installed automatically by the application (recommended) or manually, using Device Manager. If driver installation has completed successfully, you will see an Installation and Configuration window that will prompt you to enter two initial settings. You should select a TCP port number and password. 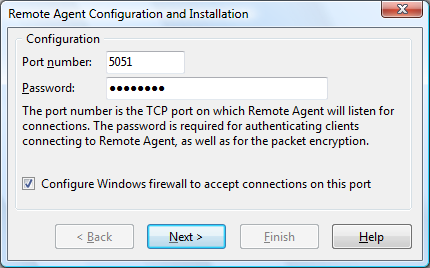 The TCP port number (5051 by default) will be used by the program to accept client connections from CommView for WiFi. The password is required for client authentication and subsequent packet encryption. Be sure to choose a long, hard-to-guess password, using alphanumeric upper and lower case characters; because if somebody guesses your password, he/she will be able to gain access to the network traffic captured by the computer on which you have installed CommView Remote Agent for WiFi. Click Next to continue, and the program will install the remaining components and launch CommView Remote Agent for WiFi for the first time. Once the installation and initial configuration have been completed, the program's icon should appear in the system tray as shown below. Clicking on the icon will bring up an application window that displays the program status – the port number that CommView Remote Agent for WiFi listens on, the IP address of a client that is currently connected to it, packet transmission statistics, and buffer utilization. Start/Resume Service – starts or resumes the CommView Remote Agent for WiFi service if it has been stopped or paused. Stop Service – stops the service. Pause Service – pauses the service. Exit – closes the CommView Remote Agent for WiFi console. Please note that the service continues to run and accept connections from CommView for WiFi. Change Port – allows you to change the port number that the application listens on. Change Password – allows you to change the connection password. Language – allows you to change the interface language. Contents – opens the help documentation. About – shows information about the program. Note: CommView Remote Agent for WiFi can accept only one client connection at any given time. 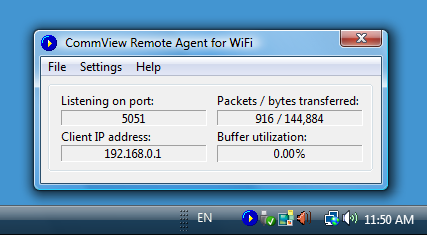 CommView Remote Agent for WiFi is a service application. This means that it starts automatically when the computer is booted up and runs even if no one is logged on to the system. The service can be controlled using the File menu described above. Additionally, as with any other service application, it can be controlled using Control Panel => Administrative Tools => Services. There you can also change the start-up mode (automatic/manual).